The Extend Exposure feature allows you to select an Xsheet’s cell containing a value and to pull it down to the desired frame. 1. In the Xsheet view, select the red arrow in the cell’s right side. Make sure you see the drag down cursor. 2. 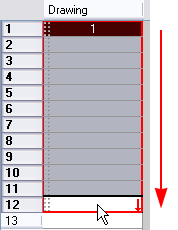 Pull down the selected cell to the desired frame. The red selection box must be visible when releasing the mouse button. If not, the action is considered cancelled.